1001 Walks You Must Experience Before You Die is the perfect guide to the world's most exhilarating walks. The ever-increasing passion for recreational walking is given fresh impetus with the creation of each new national park and wilderness area, the construction of every new walkway and the clearing of another fresh trail. The growth in popularity of pathways and woodland walks, and the conversion of canal banks and disused railways around the world to mixed-use walkand cycle-ways, means we now have unprecedented access to our cities and to ever-increasing tracts of our rural heritage. The wide-ranging, carefully chosen featured routes vary from the rugged delights of Wales's Pembrokeshire Coastal Path to the lush wilderness of Jamaica and the Harz Witches' Trail high in the German mountains. The hand-picked excursions cover overland paths, urban trails, mountain passes, coastal and shoreline strolls, and walks that explore the heritage of the world's most culturally rich destinations. There are gentle walks for beginners - some lasting barely an hour - and more demanding challenges for seasoned enthusiasts that will take months to achieve. Every page provides a wealth of information about a must-try walk, including start and end points, overall distance, difficulty rating, terrain and an estimation of the time it should take to complete, along with links to specially commissioned digital route maps. 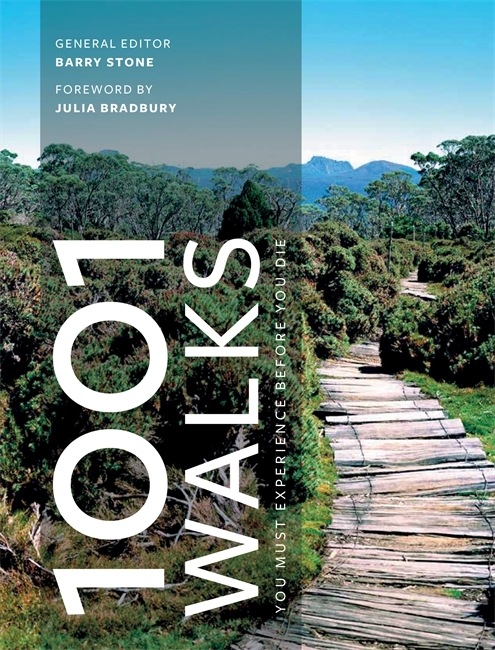 In short, 1001 Walks You Must Experience Before You Die is an essential reference guide for all those who love to get out of their cars, get off their bikes and lace up their walking shoes. Barry Stone is an experienced travel writer who has contributed to the Brisbane Courier Mail, Sydney's Sun- Herald newspaper and many of Australia's premier travel magazines, including Vacations & Travel, Get Up & Go! and Australian Traveller. He has served as contributing author to 1001 Escapes to Make Before You Die and a range of illustrative reference books, such as America: The Complete Story, Historica: 1,000 Years Of Our Lives And Times and the critically acclaimed EARTH.